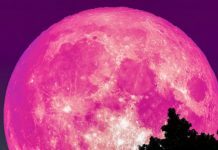 A blue moon, a super moon and a lunar eclipse will all fall on the same night on January 31, 2018 in an event that hasn’t happened in over 150 years. The last time that there was a blue moon, a super moon and a total lunar eclipse at the same time for North America was on March 31, 1866. 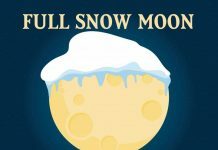 The full moon will rise on the evening of Tuesday, Jan. 30, and set around daybreak on Wednesday, Jan. 31, local time. 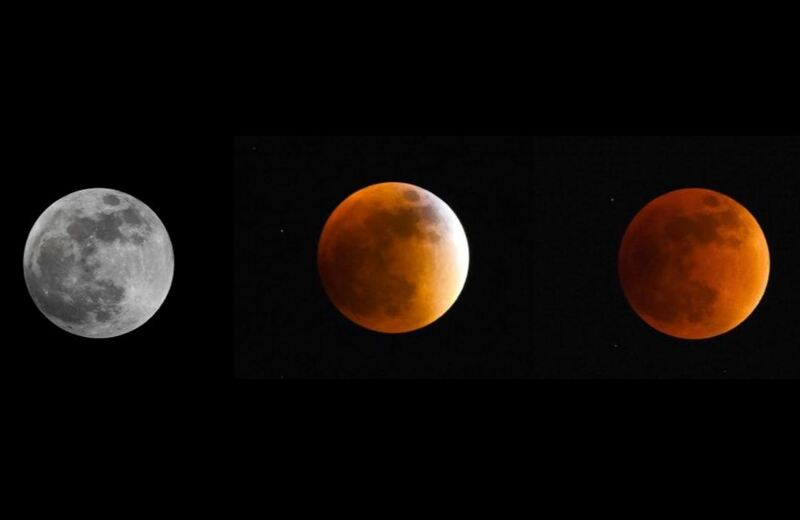 People all across North America will be able to see the moon light up the night sky, as long as clouds do not interfere, but only those in the central and western parts of the continent will be able to see a total lunar eclipse. Those in the eastern United States and eastern Canada will see only a partial lunar eclipse as the moon will set before it enters totality. Here is where you will witness the lunar eclipse. For most of the night, the moon will appear its normal color. 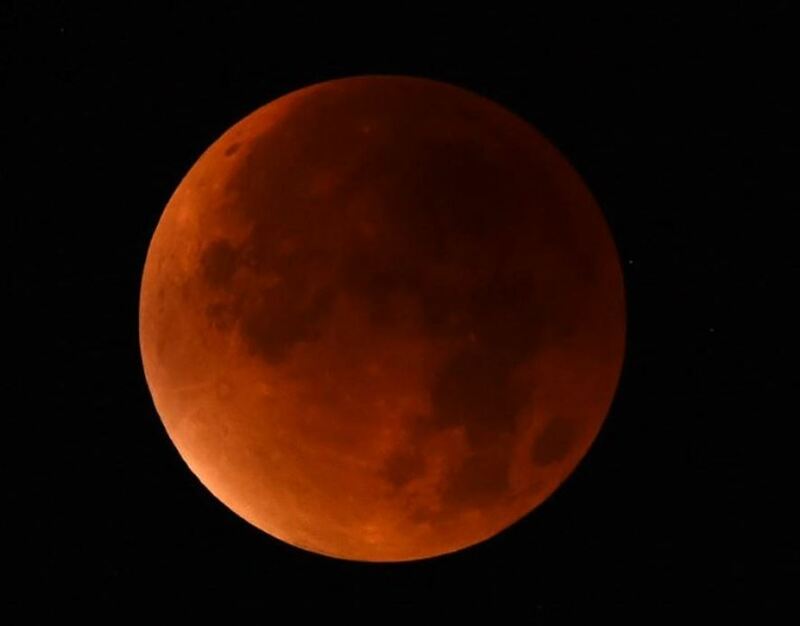 However, during the predawn hours on Jan. 31, the moon will turn a rusty orange or red color as it passes into the Earth’s shadow. This will be the first total lunar eclipse since 2015. During a total lunar eclipse, the moon passes through the darkest part of the Earth’s shadow. Unlike a total solar eclipse which lasts only minutes, this will last for several hours. 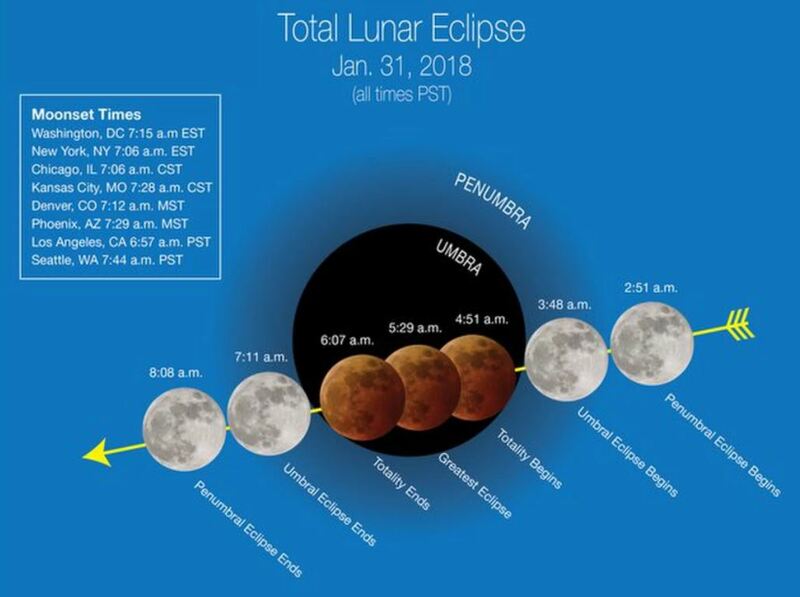 The eclipse will start around 2:51 a.m. PST on Jan. 31, but the shadow of the Earth will really begin to become noticeable on the face of the moon at 3:48 a.m. PST when the partial phase of the eclipse begins. The total lunar eclipse will occur between 4:51 a.m. PST and 6:07 a.m. PST with the height of the eclipse occurring at 5:29 a.m. PST. After the total eclipse ends, the moon will slowly regain its normal appearance with the eclipse ending at 8:08 a.m. PST. 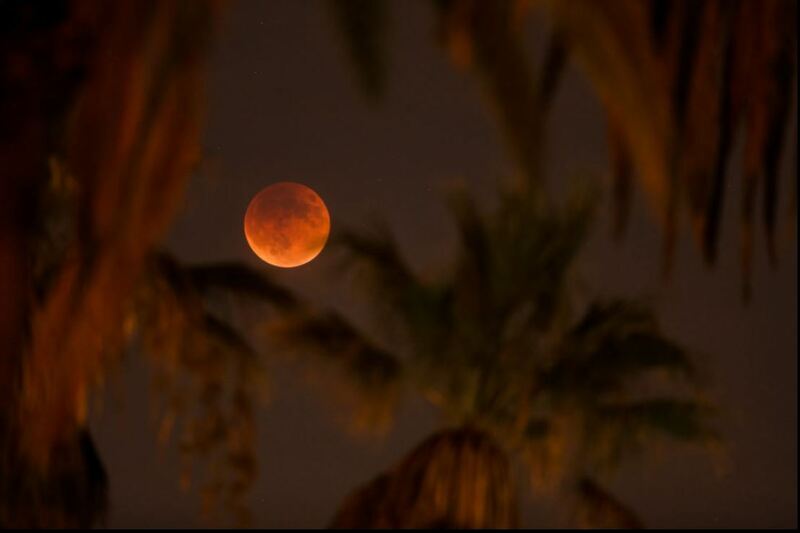 During a total lunar eclipse, the moon is sometimes referred to as a blood moon. This name is derived from the red color that the moon turns during the height of the eclipse. Some sunlight still reaches the moon during a total lunar eclipse, but first it goes through Earth’s atmosphere. The atmosphere filters out most of the sun’s blue light, so the moon looks red. Mainly clear skies should allow for excellent viewing conditions across much of the eastern and southern United States on Tuesday night into early Wednesday morning. Meanwhile, a far-reaching storm will spread disruptive clouds from the Pacific Northwest to the Great Lakes. The eclipse can also be viewed online for free on NASA TV or NASA.tv/live. People across North America that miss this month’s eclipse will have to wait only one year for the opportunity to view another. The next time that a total lunar eclipse will be visible from the United States and Canada will be on the night of Jan. 20, 2019, with the entire eclipse being visible across all of North America. This lunar eclipse will also occur during a full super moon, making the blood moon appear larger than the average lunar eclipse. 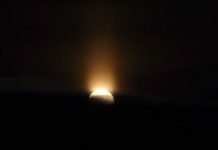 Learn more about this rare and powerful space event here. Thanks I will have a look! According to this Great Tribulation, there is a new attack of very strong depressive energies. Did someone also felt it? I saw many of my friends and animals tired.